My roots are Cornish and I have spent a good deal of time roaming and living in Cornwall during my life. Many of the greatest writers of our country were either born in the West Country or lived there at some point. The land brings such inspiration to creative people and I am sure that others feel the magic of the Universe when they stand on a misty moor or take a walk through Luxulyan. But, perhaps they don’t. The Cornwall I think of when I hear it’s name, are the narrow leafed lanes and the small communities who speak in guttural tones. This I why I love reading A. L. Rowse. His ‘Cornish Childhood’ was a bestseller in its day and is still read now. In it, Rowse writes only about his young life before he leaves Cornwall for Oxford. But through his words, the reader soon understands the Cornish society, its people and its landscape. Rowse came back to his Cornwall following his Oxford years and lived in the house by the sea at Trenarren, where he always thought he would. He wrote many books in addition to his meticulous diaries, which were historical non fiction and in my humble opinion, he has never been given satisfactory recognition for his works. He had the rare skill of weaving facts with expert story telling and so as we read, we walk with him along the streets and meet those he describes, as if they were in our lives right now. Then, as if by magic we discover that we have learned and understood some interesting history. If I had been given his books to read at my school, instead of listening to the constant droning of teachers who obviously understood little of what they taught me, I should have learnt a lot more, a lot sooner. A L Rowse quickly dropped out of fashion and out of the Oxford set in the 20’s and 30’s due to his forthright and often rude manner. He could be arrogant and suffered no one he considered a fool. I only recently met a man who knew him at University when they were both lecturers and he told me a tale of an unpleasant conversation they had had. I will not repeat it here, but have heard similar reports on different occasions. When you read his early work it is possible to see what turned this rather clever boy from a relatively poor background, into the capricious and complicated man he became. I believe his attitude was the classic defence mechanism of a man who did not want to let anyone in. He collected a great library of books, many first editions, which he bequeathed to the University of Exeter, The Royal Institution of Cornwall selected some and others were sold to dealers. I have quite a few of his books, many signed. It is rumoured that some wag said that in the latter years, a book not signed by A L Rowse would be worth more as it was rarer than a signed one. One of the books I bought from a dealer had a personal photograph of Rowse alongside a letter written by him. Just an everyday letter, but I treasure it. 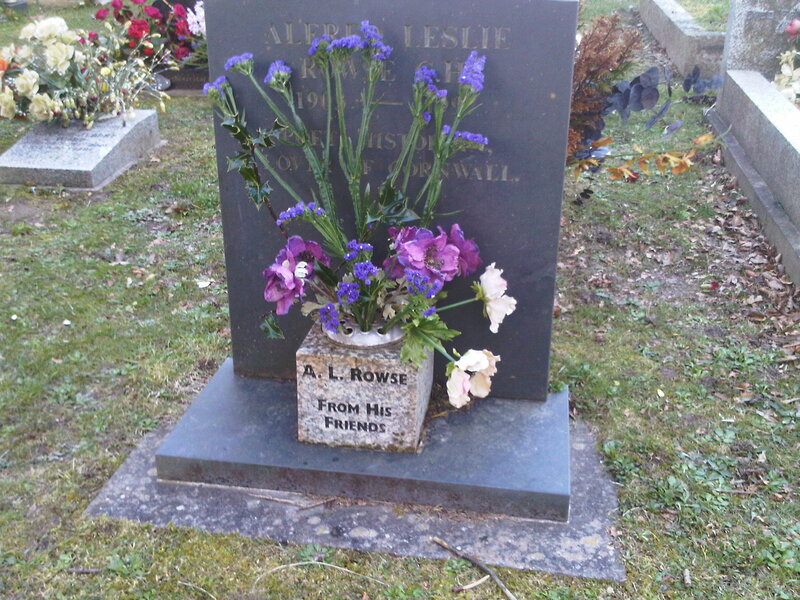 When I go to Cornwall, I visit his grave and place flowers. He has other friends living in the area still, who tend his grave and his memory and another book is being written about him now. It seems he is not forgotten. Although so much of old home ground has been altered by new roads and buildings, if you read his work and that of his friends, such as Dr James Whetter, it is possible to find the lanes and the fields he talked about. You can eat your lunch under the viaduct at Luxulyan as he did at Christmas with his good friend David Treffry . Or you could walk up the high lanes and sit and look at the spectacular view. I have done that. Rowse’s Cornwall is the Cornwall I think of, for it changed little from his younger day to my childhood. It has changed dramatically since then. I don’t know how many times I have read ‘A Cornish Childhood’, but I do know that it’s not too many.